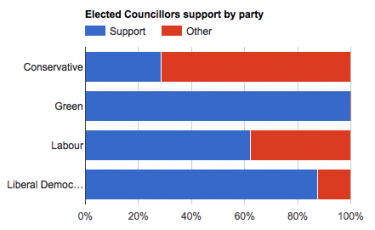 Following a hard fought campaign Space for Cycling emerged as the clear winner of the Bristol 2016 elections, securing not only the mayoralty, but also 63% of all the Councillors. In taking up the challenge of making Bristol a great cycling city he will have the strong support of a new Council dominated by Space for Cycling councillors. In fact, 45 of the 70 councillors are part of Space for Cycling, with 23 also representing Labour, 11 representing Greens, 7 Liberal Democrats, and 4 Conservatives. You can see who they are, and what they say about Space for Cycling, here. Bristol Cycling Campaign looks forward to working with Mayor Marvin Rees on the strategic changes to deliver Space for Cycling. We will also be working with Councillors and Neighbourhood Partnerships across the city to produce Neighbourhood Good Transport Plans.